The governments of Greece and North Macedonia said on Tuesday (19 February) they would aim to decrease roaming charges by the start of this year’s tourist season, until their complete abolition in 2021. 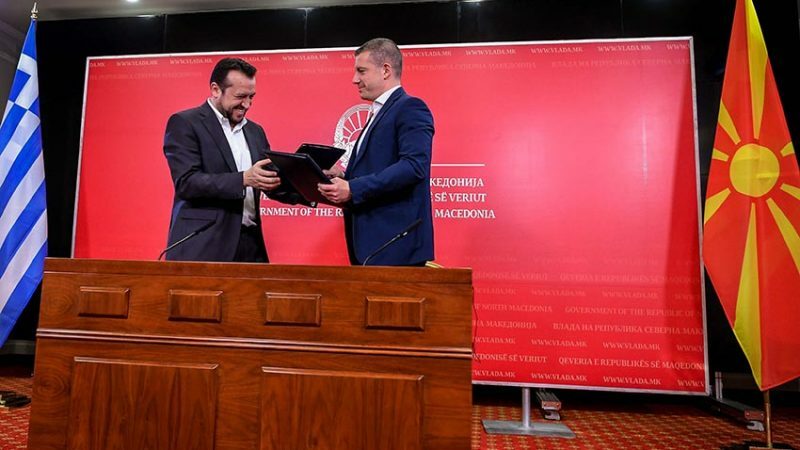 The agreement was signed during a visit of Greek digital minister Nikos Pappas to Skopje, where he met with his North Macedonian counterpart Damjan Mancevski. In June 2018, Greece reached a breakthrough deal with the Former Yugoslav Republic of Macedonia (FYROM), the so-called Prespa Agreement. The deal resolved a 25-year dispute over the country’s name, agreeing on ‘North Macedonia’ to replace FYROM. “Let’s make the Prespa Agreement a people’s agreement,” Papas said, adding that the deal should produce results that improve people’s lives on both sides of the border, such as communication capabilities, mobility opportunities and economic prospects. Katerina Notopoulou, who is a candidate for the mayor of Thessaloniki and the former deputy minister for Macedonia and Thrace, told EURACTIV.com that the Prespa Agreement would turn the Balkan region from Europe’s warehouse to a peaceful cooperation-driven place. For Thessaloniki, she said, the name deal paves the way for stronger growth perspectives. “It is well known that the structures of the two countries’ economies complement each other, so there are no unfair competition issues – the opposite. It is a very crucial issue for exports,” she noted. She added that North Macedonia and Greece were excellent trading partners and that there are already talks about rail connections and transport networks, social structures and infrastructure. “All this will create a new setting in the Balkans,” she said. >>Watch the video interview: Subtitles available by clicking the CC button. Notopoulou added that both governments and people are working in order to avoid setbacks in the deal, but underlined the danger from the rise of extreme-right voices. “Especially in Thessaloniki, we noticed terrible phenomena that turned us back. The ugly odour of the far right came out from the cesspools of Thessaloniki,” the leftist politician said. “There was an attempt to publicly thwart the mayor of Thessaloniki. There were posters that repudiated SYRIZA’s MPs in order not to vote in favour of the Prespa Agreement. There have been murderous assaults,” she said, adding that the main opposition New Democracy party bears some responsibility due to its stance on the issue. “We all remember at the beginning of 2018 what exactly was New Democracy’s position and how suddenly, without any rational arguments, any historical or political evidence, it opposed the Prespa Agreement while at the same time its leader, Mr Mitsotakis, was giving credentials to the European People’s Party,” Notopoulou said. Contacted by EURACTIV.com, New Democracy declined to comment.